Instead of grabbing your phone to give Pizza Hut a call, grab your oven mittens and make this recipe instead! Your waistline, wallet, and taste buds will all thank you. Preheat oven to 450 degrees. Dissolve 1 tsp yeast in 1/3 cup warm water for about 8-10 minutes. Then stir in oat flour plus a dash of salt and garlic powder if desired. Knead and flatten dough onto greased cookie sheet, making a circle. Bake for about 10 minutes, until crust is crispy. Meanwhile, mix greek yogurt and ranch seasoning mix together and set aside. 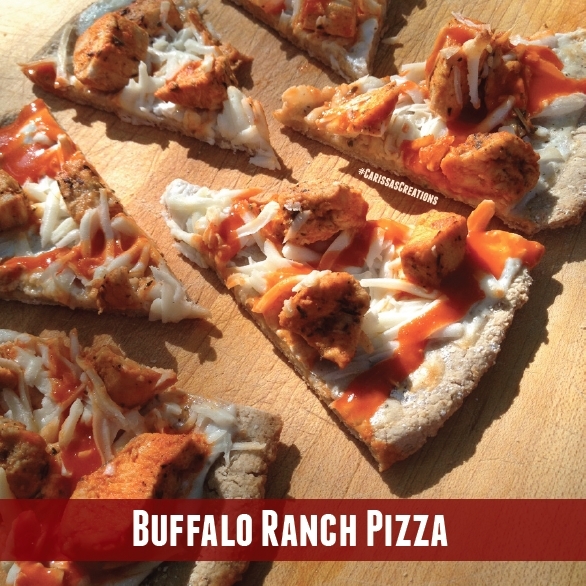 Toss the chicken with Frankâ€™s buffalo sauce. Once crust is done baking, spread with greek yogurt mixture then top with cheese and chicken. Return pizza to oven for about 5 -10 more minutes. (Unfortunately fat free cheese doesnâ€™t melt very well). Drizzle with more buffalo sauce if desired!